Having enjoyed You can’t teach an old dog New Ticks, Walking Man and Hubcap Music by Seasick Steve, I thought I would listen to Sonic Soul Surfer, his seventh studio album, which was released 23 March 2015. It is the follow up to the 2013 Album Hubcap Music and contains a healthy mix of country, boogie, rock, foot stomping deep south rhythm and blues and slower paced ballads. He is Accompanied on the album by Dan Magnusson on drums, Luther Dickinson on slide guitar, Georgina Leach on fiddle and Ben Miller on the Jew’s harp). In this album he draws on songs from his travelling past (and even channels Seth Lakeman at one point). The band’s 2001 debut album Gorillaz sold over seven million copies and earned them an entry in the Guinness Book of World Records as the Most Successful Virtual Band. It was nominated for the Mercury Prize in 2001, but the nomination was later withdrawn at the band’s request. Their second studio album, Demon Days, released in 2005, was equally successful Going five times platinum in the UK, double platinum in the United States, and earning five Grammy Award nominations for 2006, winning the Best Pop Collaboration with Vocals category.The band’s third studio album, Plastic Beach, was released in March 2010. Their latest album, The Fall, was released in December 2010 as a free download for fan club members, then in April 2011 as a physical release. The future of the project was once under speculation due to the status of Albarn and Hewlett’s friendship; however, Gorillaz plan to release new material in 2016. In the meantime Blur reunited in 2008, with Coxon back in the fold, for a series of concerts and have continued to release several singles and retrospective releases since. In 2012, Blur received a Brit Award for Outstanding Contribution to Music (And Adele Adkins got cut off in her prime) and have since announced that they were releasing an album entitled Magic Whip, which is due for release April 2015. British World Land and Water speed record holder Donald Malcolm Campbell, CBE was born 23 March 1921. He broke eight absolute world speed records in the 1950s and 1960s. He remains the only person to set both world land and water speed records in the same year (1964). 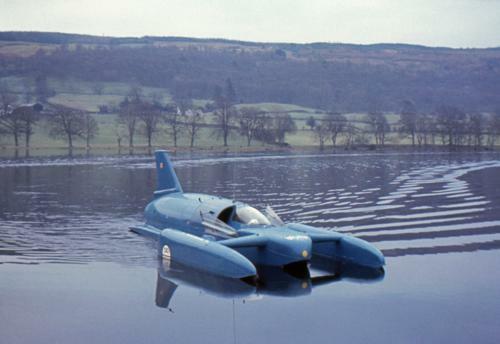 Campbell began his speed record attempts using his father’s old boat Bluebird K4, but after a structural failure at 170 mph (270 km/h) on Coniston Water, Lancashire in 1951, and the death of John Cobb, who was killed in 1952 trying to break the water speed record, he decided that he would develop a new boat. Designed by Ken and Lew Norris, the Bluebird K7 was an all-metal jet-propelled 3-point hydroplane with a Metropolitan-Vickers Beryl jet engine producing 3,500 lbf (16 kN) of thrust. It was unveiled in late 1954, and taken, in January 1955, to Ullswater Westmorland in the English Lake District for its initial trials. After many, problems and a number of modifications to K7, Campbell finally succeeded on Ullswater on 23 July 1955, where he set a record of 202.15 mph (325.33 km/h), beating the previous record by some 24 mph (39 km/h) held by Stanley Sayres.The name “K7″ was derived from its Lloyd’s unlimited rating registration. It was carried in a prominent circular badge on its sponsons, underneath an infinity symbol.Campbell set a total of seven world water speed records in K7 between 1955 and 1964. The series of speed increases—216 mph (348 km/h) later in 1955, 225 mph (362 km/h) in 1956, 239 mph (385 km/h) in 1957, 248 mph (399 km/h) in 1958, 260 mph (420 km/h) in 1959—peaked on 31 December 1964 at Dumbleyung Lake, Western Australia when he reached 276.33 mph (444.71 km/h); he remains the world’s most prolific breaker of water speed records. Campbell was awarded the CBE in January 1957 for his water speed record breaking, and in particular his record at Lake Mead in the USA which earned him and Britain very positive acclaim. 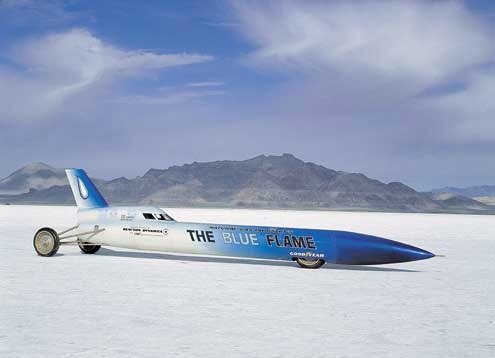 In 1956, Campbell began planning a car to break the land speed record, which then stood at 394 mph (634 km/h). The Norris brothers designed Bluebird-Proteus CN7 with 500 mph (800 km/h) in mind. The CN7 was completed by the spring of 1960, and was powered by a Bristol-Siddeley Proteus free-turbine engine of 4,450 shp (3,320 kW). Following low-speed tests conducted at the Goodwood circuit in Sussex, England, the CN7 was taken to the Bonneville Salt Flats in Utah, USA, scene of his father’s last LSR triumph in 1935. The attempt was unsuccessful and CN7 was written off following a high-speed crash in September at Bonneville. Campbell was seriously hurt, suffering a fracture to his lower skull, and was by 1961 on the road to recovery and planning the rebuild of CN7. The rebuilt car was completed, with minor modifications, in 1962 and, by the end of the year, was shipped to Australia for a new attempt at Lake Eyre in 1963. The Lake Eyre location was chosen as it offered 450 square miles (1,170 km2) of dried salt lake, where rain had not fallen in the previous 20 years, and the surface of the 20-mile (32 km) track was as hard as concrete. As Campbell arrived in late March, with a view to a May attempt, the first light rain fell. Campbell and Bluebird were running by early May but once again more rain fell, and low-speed test runs could not progress into the higher speed ranges. By late May, the rain became torrential, and the lake was flooded. Campbell had to move the CN7 off the lake in the middle of the night to save the car from being submerged by the rising flood waters. The 1963 attempt was over.